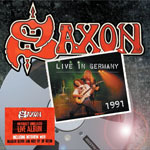 Share the post "Album review: SAXON – Live In Germany 1991"
You could argue: why do we want another Saxon live album from a time when arguably they were past their peak? Don’t be so miserable. Recorded in Germany in 1991 the band had just recorded ‘Solid Ball Of Rock’ and included the title track from that album. But apart from that it is essentially business usual as they power their way through a “greatest hits” selection which so often happens when a band is “between albums”. It is another chance to hear the classic modern line-up of the band (with Graham Oliver replaced by Doug Scarratt in 1996) and, mastered from the original tapes, the audio is excellent. It was evidently recorded also for German radio at the time. The band are on form, though, and in terms of their songs it really doesn’t get any better. Three tracks were included from their first EMI album in 1985 ‘Innocence Is No Excuse’ (Back On The Streets, Rock And Roll Gypsies, Broken Heroes) and one from 1988′s ‘Destiny’ (‘Ride Like The Wind’). The early nineties was a difficult time for traditional heavy rockers and Saxon didn’t find it any easier, even given their ascendant status in the years 1980-1982. In respect of labels they had been released from their late-1980s deal with EMI and had lost their bass player Steve Dawson during this period. By the end of the 1990s they would become embroiled in litigation as previous members Oliver and Dawson tried to wrestle back use of the band name. This entry was posted in ALBUM REVIEWS, ALBUM REVIEWS (Mobile), All Posts and tagged album, Biff Byford, Graham Oliver, heavy metal, heavy rock, Live In Germany 1991, Nibs Carter, Nigel Glockler, Paul Quinn, review, Saxon. Bookmark the permalink.